Harry Chapman believes Sheffield United’s relentless approach can make them a force to be reckoned with in League One this season. The winger, on-loan from Middlesbrough, scored the only goal of last night’s game against Bristol Rovers as Chris Wilder’s side stretched their unbeaten run to six League One games. Although the visitors, who were later reduced to 10 men when Jermaine Easter was dismissed for a crude challenge on Jack O’Connell, posed United numerous problems, Chapman said: “The lads have shown they’ve got the character to keep on going, no matter what, and get the results. And that, a really strong team spirit, is a huge thing to have. “Training is full-on , there’s never any relaxing and we’re always getting pushed. That’s why we can show the same qualities in games. Chapman, who replaced Stefan Scougall early in the second-half, headed home Daniel Lafferty’s centre as United climbed back into the play-off positions following Saturday’s draw at leaders Scunthorpe. Wilder later revealed that Scougall had been withdrawn after feeling ill during the interval and will be assessed ahead of this weekend’s visit to Fleetwood Town. 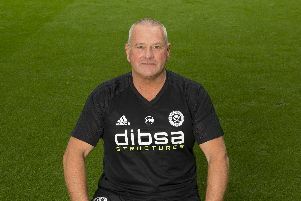 Despite praising his players for an “excellent September”, Wilder said: “The only criticism I have is that, after they had gone down to 10 men, we weren’t ruthless enough to go and get that second goal.